The Primary Is Over. Here’s What Hillary Clinton Needs to Do Next. Hillary Clinton enters the general election with considerable advantages over Donald J. Trump: She has a stronger and better-funded organization, and the electoral map is tilted in her favor. President Obama’s endorsementon Thursday accelerated the process of rallying Democrats around her candidacy. Mrs. Clinton now has a chance to exploit that edge, while Mr. Trump struggles to bring together the Republican Party and build an effective campaign organization. It is no accident that Mrs. Clinton’s first campaign swing of the general election will take her next week to Ohio and Pennsylvania, and that her first joint rally with Mr. Obama will be in Wisconsin. Mr. Trump has long vowed to compete in traditionally Democratic-leaning Midwestern states, viewing the Rust Belt as the cornerstone of his electoral map. Given Mr. Trump’s dismal standing with Latino voters, his prospects look tenuous in traditional swing states like Colorado, Florida and Nevada. That means his most realistic path to victory runs not only through Ohio, a perennial battleground, but also through states like Michigan and Pennsylvania that have not voted Republican in a generation. If Mrs. Clinton can fortify her support in these areas, Mr. Trump’s electoral map may disintegrate. Economic issues remain a rare area of strength for Mr. Trump in the general election. A New York Times/CBS News poll last month found that a majority of voters viewed Mr. Trump unfavorably and lacked confidence in his ability to be commander in chief. But half of voters said they were confident that he would make good decisions on the economy, giving him a hairbreadth edge over Mrs. Clinton on the issue. During the Democratic primary, Mrs. Clinton spoke often about economic fairness and tried to reassure liberal voters anxious about rising inequality. She now has an opening to communicate in more concrete terms how she would bring about broad prosperity — and to attack some of Mr. Trump’s more controversial proposals, like his offhand suggestion that the United States print more money to pay its debts. Mr. Sanders may take some time to wind down his candidacy and give a full endorsement to Mrs. Clinton. But she doesn’t need to wait for his signal to start courting his most energetic voters, whose support she will need to beat Mr. Trump in November. 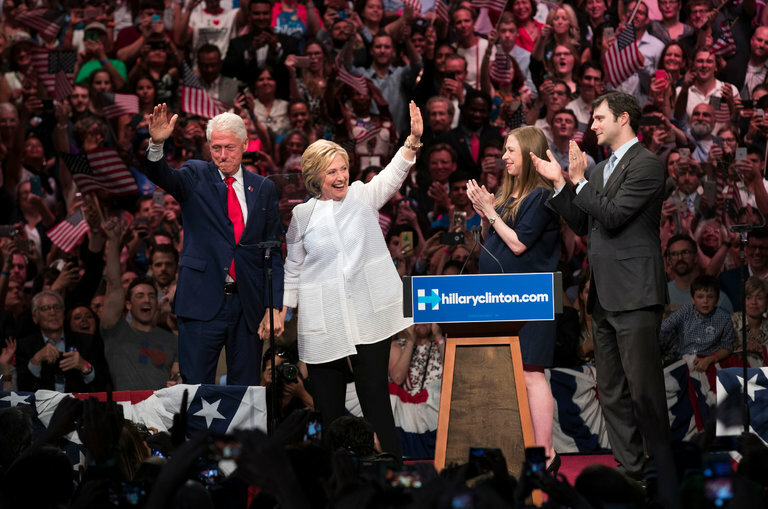 The hope among Clinton allies is that she can bring reticent liberals on board with a sharp message of contrast with Mr. Trump, rather than an explicit campaign to placate the pro-Sanders left. Sanders supporters, however, say they hope to hear new talk from Mrs. Clinton about the issues at the core of his campaign, like raising the minimum wage and ridding the political system of big money. Mrs. Clinton has signaled repeatedly, including in her victory speech on Tuesday, that she plans to go after Republican votes in the general election. But she has been viewed with distrust (or worse) on the right for a generation now, and persuading anti-Trump Republicans to support her may require a more direct appeal. There is a history of candidates’ showcasing across-the-aisle support at their party’s convention: Senator Joseph I. Lieberman of Connecticut, an independent who caucused with Democrats, trumpeted John McCain in 2008, and Senator Zell Miller of Georgia gave George W. Bush a big lift in 2004. Look for prominent Republican faces when the Democrats gather in Philadelphia to nominate Mrs. Clinton next month. As the nomination slipped out of reach for Mr. Sanders, his campaignpledged to push for changes to the Democratic platform that reflect his campaign’s ideological priorities. And Mr. Sanders has named some provocative allies, including the activist professor Cornel West, to the committee that will shape the party’s formal statement of principles. The challenge for Mrs. Clinton will be placating the Sanders bloc and avoiding an unsightly spat, without committing to changes that undermine her own agenda. The trickiest debate may come over Middle East issues, as Mr. Sanders has called periodically for a break from the traditional American policy of lock-step support for Israel.